Free Shipping Included! 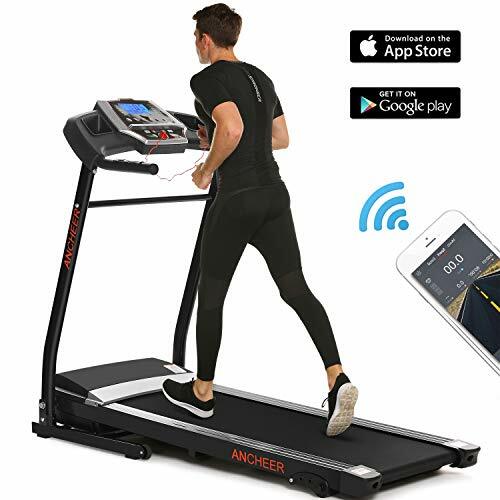 ANCHEER App Control Electric Treadmill (Black_APP Control) by ANCHEER at Sweat NY. Hurry! Limited time offer. Offer valid only while supplies last. 【 SMARTPHONE APP CONNECTION 】 - Pairs to downloadable free of charge FitShow app for iOS & Android devices via Bluetooth. App controling is not just make boring exercise routines to exciting fitness sessions, but it also helps to track your workout data more efficiently. 【 PROGRAMS & HEART-RATE SENSOR 】 - 12 Pre-set programs and heart sensor, you can choose the best plan that suits your need monitoring your heart-rate changes to alter different plans. 【 SOFT DROP PLATFORM & MANUAL INCLINE 】 - Designed with soft drop system, you don't need to worry about damaging your floor. Also, this treadmill is equipped with 3 level manual incline and built in speakers. 【Amazingly Low Noise Motor and Safety Emergency 】 - Provide safe and quiet workout experience. This foldable treadmill comes with built in safety key to ensure instant shut-off under emergency situation. The 2.25HP motor ensures perfect performance for walking, jogging, running and cardio workout at home. 【Warrenty & VIDEO INSTALLATION GUIDE】- 1 year quality warranty for frame and motor. Please search r4AcTed1Awc on Youtube to access to video installtion Guide. If you have any questions about this product by ANCHEER, contact us by completing and submitting the form below. If you are looking for a specif part number, please include it with your message.